Camisasca Automotive Manufacturing is the world's leading manufacturer of quality metal license plate frames and other premium automotive parts and accessories. 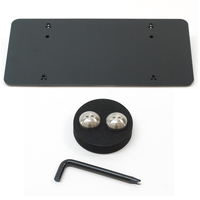 And now we have added several new items from Camisasca that include a universal license plate mounting bracket, clear polycarbonate plate protector and anti-theft plate bolts. Check out these new products and more below.